There she is. The most famous painting in the world. 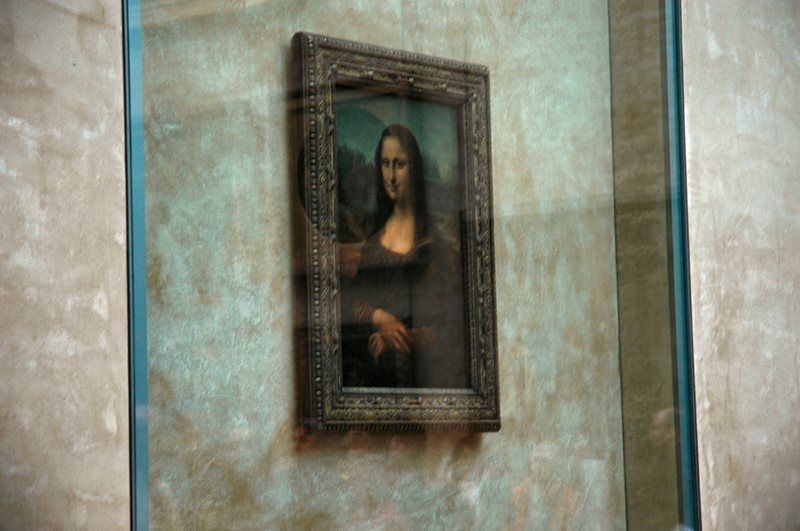 The one everyone comes to the Louvre to see. Moments later, while I was WAAAAYYYYY at the back of the room, I snapped a long view because I was more interested in capturing how many people come to gawk at this other Lisa. Next thing I know, a VERY tall and stern guard comes up behind me and waggles his index finger at me, telling me no photos allowed (duh) and then commanding: "Delete". (I delete that one while he actually looks over my shoulder at the camera screen to make sure he sees me do it, but he doesn't notice THIS one!) Then ordering: "Turn camera off." (I oblige.) Then pointing at my purse: "Put in your bag." (Damn, he REALLY wanted to ensure I wasn't going to take another photo in that museum!) Then he stalked off to harrangue his next victim. Being a natural rule-challenger, I so wanted to sneak back in and take the same photo (an "I'll show YOU" moment) but decided if I got thrown out on my derrière, it would ruin the visit for my friend Laura who had only a day and a half to see Paris. And we hadn't seen the Venus de Milo or anything else yet. At least I had the satisfaction of getting THIS one though. Tant pis for the Louvre. The reason they don't allow even non-flash photography in most museums now is that with the advent of high-quality digital cameras, a good photographer could really eat into the museum's royalties from book and poster sales of their art works. 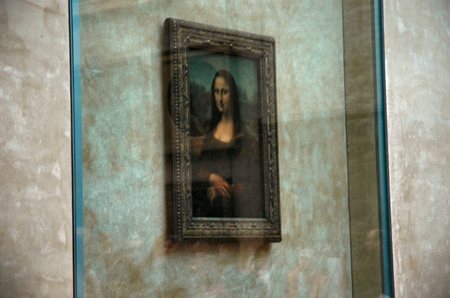 In the past you could walk around any museum in Paris and take photos to your heart's content as long as you didn't use a flash, which is damaging to the paintings. But it's not likely THIS photo would ever make me any money: wrong angle, wrong lighting, glare from the glass. No, she's just for me (and you), sitting there smiling in her little climate-controlled glass security box. My belief is that she's thinking: "I can't believe you people are THIS interested. I HAVE no secrets; I'm smiling because Leonardo just told a dirty joke."